No doubt you have seen the latest version of Google Analytics and here we discuss some of the latest new features. Perhaps one of the most useful additions is the ability to create multiple dashboards. this is something that we use a lot here at SGM Towers as it can really help with your at-a-glance analysis. Here you can see a PPC dashboard and a SEO Dashboard. From here you can specify what sort of widget you wish to show. These are self-explanatory. Once you have decided what widget you wish to show you add a metric. Let’s choose time line to chart the ebb and flow of PPC traffic bounce rate for the past 30 days. You can select from the list (Hint: It’s a long list so try typing the name of the metric rather than scrolling all the way through!). 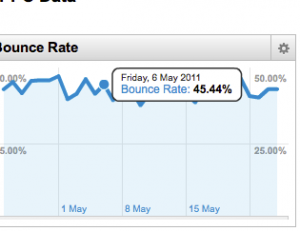 Let’s select Bounce Rate. 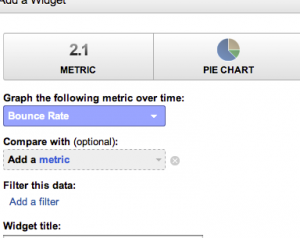 You also get a box to select another metric to compare to. However we won’t worry with this on this example. Next we need to add a filter to get just PPC Data. We add in Medium in Filter, and in this context, PPC is known as cpc (lower case). It should now look like this. Whilst it can take time to set these up, it is definitely worth the effort. Not only helping you to identify issues and keeping track of your campaigns, but also being something that can be incorporated into client reports easily. Stick around whilst we report on other new aspects of Google Analytics.